It seems that there is no limit to things that are supersized in our modern world. Movie popcorn comes in tubs large enough to bathe a small child. On the roads, there are cars that resemble tanks with gas mileage so low the driver’s gas bill is also supersized. There are televisions so large they can be seen from space. Even Oregano’s beloved “big cookie” is a supersized version of the average chocolate chip cookie. Now there are marshmallows the size of a child’s fist. The weather has finally been perfect to use our fire pit. To celebrate our first fire of the season, Oregano stopped on this way home from work to pick up the fixin’s for s’mores: graham crackers, chocolate and marshmallows. I was stunned by the size of the marshmallows he purchased. These were no ordinary marshmallows. They were marshmallows on steroids touted as “Giant Roasters.” The bag is adorned with a deranged-looking marshmallow man donning a shirt with a flaming marshmallow while holding a stick with a marshmallow on the end. To stay on topic, let’s ignore the disturbing fact that this cannibalistic marshmallow man is roasting the head of one of his own species. Pay no attention to the disturbing idea that this marshmallow man is roasting the head of one of his own species. Just think about how delicious the marshmallow will be. A brand name like “Campfire” leads one to believe that these marshmallows were created for the sole purpose of being roasted over a campfire. Many would be destined to become the glue that holds a s’more together. In theory, these marshmallows of unusual size are an enticing concept, but as we discovered later that evening over our roaring fire, they didn’t live up to the hype. The mammoth marshmallows required a longer time in the fire to even begin to melt. This was a sacrifice we were willing to make given the amount of gooey goodness we would soon be enjoying. However, when we began to assemble our s’mores, we discovered that these marshmallows lack meltability. Only a third of it slid gently off the skewer, leaving behind a sticky glob of denuded marshmallow. Even though there was only a thin layer of marshmallow, it did not stay nestled neatly between the graham crackers. When compressed, the hot, white goo oozed out every side and slid down our wrists. We assumed our inexperience with marshmallows of this girth meant that we had not left them over the fire long enough. Still stuck on the skewers, we placed the innards of the marshmallows back into the fire and made our second attempt only to have the same thing happen. In all, we had to return a single marshmallow to the fire three times to finally melt the entire thing. I was stuffed and sticky from the three s’mores I had just eaten to finish off my marshmallow, but Oregano was determined to master the melting process. Unfortunately, his second attempt didn’t yield better results. He left the marshmallow over the fire longer, but eventually the outer most layer burst into flames. We watched as the charred exterior liquefied, slid off and dropped into the fire exposing the unmelted underbelly of the marshmallow. It was a vicious cycle. As we sat there by the embers of the fire, we began debating the merits of the various sizes of marshmallows. “Instead of a sadistically smiling marshmallow man, there should be a warning on the bag: not recommended for making s’mores,” I said while licking the sticky remnants of the marshmallow off my wrists and hands. “Even if they supersized the graham crackers so that the marshmallow didn’t ooze over the edges, we’d still be left with the melting problem. They’re just too big,” Oregano said. “They’re better suited to floating in a mug of hot chocolate. I guess I should have just gotten traditional marshmallows,” he concluded. There is a reason that the classic-sized marshmallows have endured since 1948 when they were first extruded into the spongy cylinders we know and love. They melt evenly and when compressed, stay contained within the boundaries of the graham cracker border. Do not be lured by packages of jumbo marshmallows proclaiming to be superior. In our supersized society, tradition is usually pushed aside and bigger is perceived as better. Size does matter. At the risk of sounding like Goldilocks, sometimes smaller is just right. A big thank you to MJ of Memoirs of an Evil Stepmom and Emma from Emma’s Ramblings on Supernatural Fiction for sharing the Sunshine Award with me. Emma is a loyal reader whose cheerful comments always bring sunshine to my day. MJ is a new reader who wasted spent over an hour of her life catching up on some of my previous posts. Visit their blogs to see what they are both up to. Posted in Uncategorized and tagged humor, life, marshmallows, s'mores. Bookmark the permalink. You silly girl!! We “experienced” campers and s’more’s makers didn’t even attempt to roast that gargantuan piece of inflated sugary gooey-ness. We less adventurous folks cut them in half first. But the bag is truly morbit – what were those guys in marketing dept. thinking!?!?!? Perhaps we should have consulted “experienced” campers. It never occurred to us to cut the marshmallows in half. As for the cannibalistic marshmallow man…I have no idea what they were thinking! That spooky marshmallow guy is rather off-putting – who designs these little fellas? Back to the drawing board on both the product and the concept methinks! What I would like to know is who designed the creepy marshmallow guy, but also, who approved that design for the package and which ideas did they reject? Next time, we’ll stick to the classic marshmallow. Cannabalistic marshmallows. Now there is a novel – but very accurate – thought. And bigger is not always better. Thanks for the heads-up. So glad you enjoyed my marshmallow related public service announcement. Beware the cannibalistic marshmallow man. At first I thought your obsession with the over-sized marshmallows may have been the result of taking in too much smoked Oregano, but the graphic at the end explains everything. A cannibal marshmellow man. How goulish. I wonder…was this a clever marketing ploy to sell more marshmellows? Were they playing on our psyche, something we’re not overtly aware of? Oh, and we’ve all fallen for the giant marshmellow trick. NOT for s’mores…better for a cup of hot cocoa. Yes, in this case for certain, bigger is not better. The cannibalistic marshmallow man is definitely ghoulish. I would have loved to been in the marketing meetings when they decided on that particular version of a marshmallow man. Were the other versions too kind or even more menacing? It really does matter. It’s also a problem with fruits and veggies. I bought some beautiful strawberries- big and red…. and absolutely tasteless. But ya know, it’s not how it tastes, but how it looks! You’re so right. It is all about how it looks because that is what gets you to buy it. Once it is home and you taste it, it’s too late. They already have your money. I am puzzled – what on earth is a s’more? Can you post a picture of what it’s supposed to look like? I don’t think they’ve made it down to South Africa either. I feel quite bereft. We also have a tradition of roasting marshmallows over the fire down here, but we don’t have Graham crackers… Having only had my first Graham crackers during our recent visit to the US, I now KNOW how delicious they are, and cannot understand why they have not sailed this far south. I haven’t found any equivalent crackers on the shelves here… If they are an essential ingredient of s’mores, I guess I will have to wait until a future trip to the US? Or perhaps there is a potential niche export market waiting to be explored here? Ask and you shall receive… there is now a picture of a s’more in the post for my international readers who have never had the pleasure of eating one. My condolences on the lack of graham crackers in South Africa. They are delicious. Oooh!!!!!! Double OOooooooHHH!!!! Those look scrumptious! When the marshmallow melts just right causing the chocolate to melt just a bit, they are! Thank you for the mention on your blog and the award! Roasting marshmallows over a fire is fun. I actually enjoy roasting them more than eating the actual marshmallows. Most packages of marshmallows don’t have pictures of cannibalistic marshmallows on them so have no fear. I have seen those gigantic marshmallows and wondered…so thank you for letting me know that they are not good for s’mores. I have a friend who hosted some Australian exchange students a few years ago. She has a fire pit and volunteered to have the whole group over and the American kids taught them about s’mores. Apparently s’mores have not made it to Australia. Those kids were stunned and amazed by the wonderful gooey goodness that is s’mores. One more reason to love America! I’m happy to offer this public service announcement about those marshmallows. I had a suspicion that s’mores might not be a worldwide phenomenon. Several years ago we went to visit friends who live in Italy. We asked them if there was anything we could bring them from the US. Their only request was for marshmallows because they wanted to make Rice Krispie Treats. Go figure. I am cursed by disliking marshmallows. In Girl Schout, I would have to accumulate enough ingredients for four S’mores so I could use gobs of chocolate and part of one puny marshmallow. Marshmallow is not my favorite part of the s’more either, but I accept it’s presence as the glue that binds the s’more together while acting as a catalyst for melting the chocolate. Just in time for the holiday weekend. I will wow the crowd with my standard sized marshmallows, honey cinnamon graham crackers and 70% cocoa chocolate. What a treat: and they melt at the first try! The chocolate melting factor was a secondary problem with the extra large marshmallows. Since they didn’t melt well, they didn’t melt the chocolate well. Definitely stick with the standard marshmallows. You won’t be sorry. “Of all of the marshmallow pits in all of the towns in all the world, she walks into mine.” Apologies to the movie, “Casablanca.” Sorry, but you and laughingmom both brought up my first choice … “Ghostbusters.” Now I’m suddenly craving marshmallows. Isn’t it funny how many of us went directly to Ghostbusters at the mention of marshmallows? Apparently, we’ve all been traumatized by the giant Stay-Puff marshmallow man. Another good one, Paprika!! Now all I can think of is eating a S’more!! mmmmm! Thanks for the warning. I need to pick up some marshmallows for s’mores this weekend and I can guarantee you I would have fallen into the giant marshmallow trap. Sadly, we don’t manufacture as much in this country anymore, so I guess it’s good that at least we are making our own marshmallows. “The Marshmallow that Ate Manhattan” would be an interesting movie. Given this marshmallow’s resitance to melting, I’m wondering what weapons we could use to defend ourselves. Someone at the Campfire Company is being paid waaaay too much $ researching marshmallow to graham cracker ratios…..
oh, & that hour was not wasted, it was self-preservation, used wisely to distract myself from the bickering of small children in the background. I’m glad you don’t feel your hour was wasted. I’m glad you found me and that I could offer you some much needed distraction. 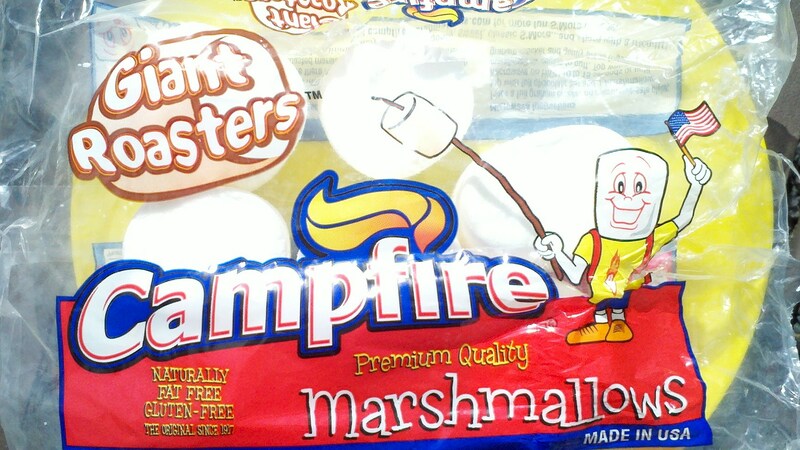 As for the Campfire Company, I’m not as concerned with the research they must have done regarding the graham cracker to marshmallow ratio and more concerned with why they choose that marshmallow mascot. Mmmm, now I am dying for a s’more! Will resist the giant marshmallow. I loved the Goldilocks refernce at the end so sweet. To be honest, I’m not the biggest s’more fan on the planet. I love to use our fire pit and sometimes a s’more just hits the spot. I’m glad you liked the Goldilocks reference. As I was reading my drafts I just kept thinking I sounded like Goldilocks, so I decided to throw that line in. Beware the M.O.U.S’s….marshmallows of unusual size! Next they’ll be selling the Stay-Puff Marshmallow Man and Gigantor Hershey Bars. And we, sadly, will eat them! If the movies are any indication, the Stay-Puff Marshmallow Man and Gigantor Hershey Bars will be trying to eat us as we desperately try to melt them into one giant s’more. I realized after I hit the ‘submit’ button that the opposite is happening to graham crackers. I recently made a cheesecake, which calls for 18 squares of graham crackers. In my previous attempts, there were always 6 squares left for me to sample as I worked on the rests of the cheesecake. Not any more. The package has gotten smaller. This one lone package amongst all the things in America that are getting bigger. HOW CAN YOU NOT HAVE HUGE GRAHAM CRACKERS IN THE MARSHMALLOWS ARE BIG ENOUGH TO COVER YOUR HOUSE? The graham cracker to marshmallow ratio reminds me of the old dilemma with the package of hot dogs and the package of buns not having the same number. Some things just don’t make sense. That’s exactly what I said when I saw the marshmallows. Thanks for taking the time to read and comment. Wishing you lots of fun with future s’moring! You are so right! Half of the fun is rushing to make another s’more and roasting another marshmallow. Returning the same melty glob of sugar to the fire takes some of the fun out of the experience. 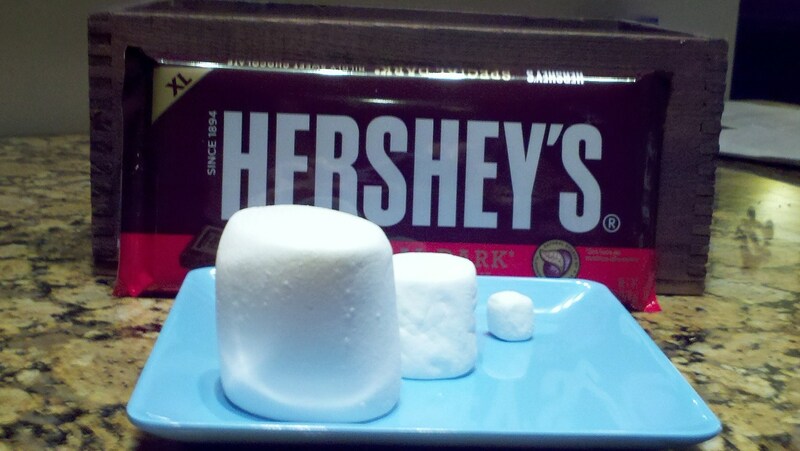 We’re definitely sticking to the normal sized marshmallows next time. I’m surprised an ordinary skewer sufficed. Those marshmallows sound big enough to warrant using a hunting spear! We had to use the skewers. Our hunting spears were in the shop being sharpened. Now I have a chocolate craving. Good post and I will be vigilant about those monster marshmallows! Congrats on the awards too! Sorry to cause the chocolate craving. Oregano has a major league sweet tooth and even he thought these monster marshmallows were too big. How true that he is roasting his own head! We got those one year for the novelty of it. It’s totally the attack of the Stay Puffed Marshmallow man like in the movie, Ghostbusters when trying to make a smore. We both thought about that scene in Ghostbusters when the marshmallow was oozing everywhere.